We can design and install affordable restaurant audio and video systems that are easy to control. 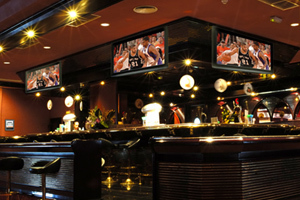 Our restaurant and bar a/v installations will take your business to the next level and help increase your earnings by keeping your customers ordering food and drinks while being entertained by their favorite sports teams on beautiful video displays. Excellent audio helps set the tone you want and gives you the ability to create different atmospheres at different times. Control music and lights with programmable background systems for single or networked multiple locations.